Life in South Korea has both it’s high and lows, positives and negatives. However there are a few things that often are mistakenly taken as true, as well as others which honestly on paper seem possible but are not. 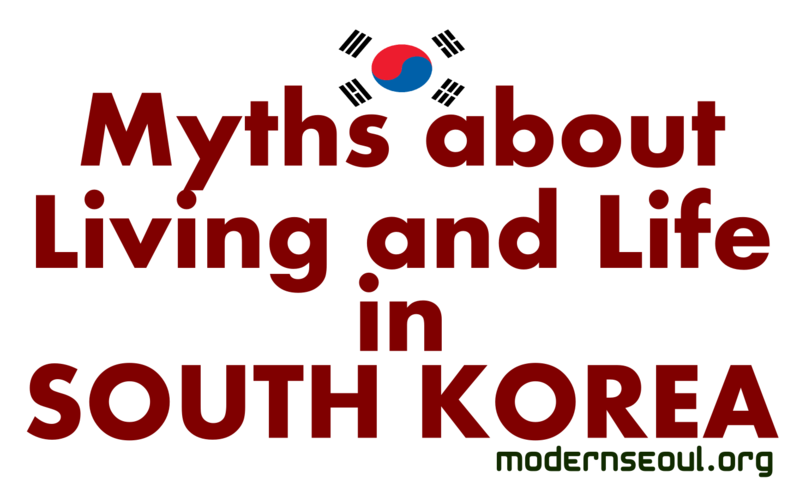 Here are 10 Myths about life and living in South Korea as well as about Koreans in general. Please note that these are our opinions and although in some cases some are true, in general they’re not. We’re also in arguing that this are right or wrong in any way, we’re just highlighting a few issues and misconceptions. Also they are in no particular order. Whilst we admit that some Hagwons are run poorly and should be avoided, on the whole the majority are run well and correctly. Having worked at over 10 different schools both private and public, there isn’t a great deal of difference in the management style. Although there have been a couple of bad eggs the rest have been fine to work at and for. We’ll make a full list of positives regarding Hagwons in the near future. It is true that some Koreans still on occasion still eat dog meat soup and that it still can be bought in certain restaurants and at some markets. However in general people don’t eat it and it’s not served in school or made at home. In reality beef and pork are high quality meats, cheaper and overall better. This is a common comment is the expat community, but it isn’t always the case. Fruit and Vegetables in South Korea are very seasonal and therefore one month certain things can be cheap and the next more expensive. Of example Apples can found cheap during October and November but in March and April they can be expensive. All also depends on where you’re shopping, Markets and Local Marts are generally cheaper than the large supermarkets like Homeplus or EMart etc. North Korea are a worry for many people as they are unpredictable and have the resources to cause some serious problems. However the firepower, allies and resources which South Korea has far outmatch them and so people are not overly worried about it. The two Koreans are basically neighbors who dislike each other but have no reason to fight. We often read online comments and blogs by people who see the only possible way for a foreigner to work in South Korea is as an English Teacher. This is of course not true and in fact English Teachers make up just a small part of the foreign working population in South Korea. You of course have American Military Service Personnel, as well as skilled and semi-skilled labor in a wide range of different industries. There are of course International students whose numbers grow year on year. PSY has been a great ambassador for KPOP and Korea around the world during both 2012 and 2013. However he is just a small aspect of KPOP which although not the best genre of music it’s certainly developing and progressing. Love it or hate it KPOP can be a big part of Korean life. This may have been true in the past however these days there are basically 2 main seasons Winter and Summer. Spring and Autumn (Fall) last maybe a month, 6 weeks at the most. They act as a buffer between the heat and humidity of the summer and the ice and freezing cold of Winter. Although on average Koreans do like and can tolerate spicy food more than the average Brit or American, not everyone likes it. It would be the same as saying all Brits like Fish & Chips or all Germans like Chocolate. This one is popular misconception, basically Koreans and people in Korea are as bad at driving as anywhere in the world. Seoul is similar to new york or London basically a 24 hour traffic jam, so accidents are bound to happen for time to time. South Korea is quite a monocultural country and therefore seeing people of a different ethnicity or nationality is sometimes a little surprising and strange for many Koreans. For some this uncomfortableness comes across as being racist. Whilst in a way it is a little, it’s not in a nasty way. Of course a small minority of people in Korea are racist, but that could be said for any country in the world. If you have any questions, thoughts or comments related to these myths please feel free to let us know via the normal social media channels, below or email. Have a great day.